Today, February 3, marks a powerful day of new beginnings. This is the Solar New Year of the Chinese calendar as well as the first day of spring in many traditional cultures. The image for today’s message was taken in Seattle two weeks ago. As I write to you now I am bringing forward the feelings of optimism. empowerment, and love that we experienced that day both personally and as a collective. The year of the Fire Rooster holds much promise. We have the opportunity to join together and set new foundations to create the world we envision. The Rooster calls in the dawn of a new day. 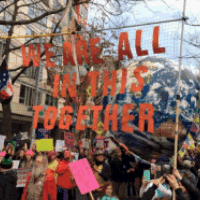 In the midst of challenges and apparent chaos, the good news is that the larger momentum of change is supporting unity, freedom, and well being for all. Those of us who participated in marches two weeks ago directly experienced the infusion of the new year’s power. Indeed, there is abundant evidence of these qualities already mobilizing in a powerful wave of unified commitment toward positive change. This is a year for the collective. It is crucial now to avoid the impulse to split apart, to polarize and to succumb to blame, judgment and fear. The forces of chaos attempt to distract, separate and fragment. Together we are invincible. Personal health and well being must be a priority this year. In addition we will be called upon to nurture our connections and relationships of support. Collaboration this year will be anchored in the personal. Much of the creative planning of the year will happen in our homes, around the dining room table, or in personal gathering places, over a cup of coffee or a pint of beer. Choose your point of focus. Large-scale acts of chaos that promote shock and violence are attempts to fragment unity. We are witnessing the final desperate gasps of old power structures that are dissolving before us. There’s no denying that it’s uncomfortable, but when we remember to connect to the big picture it can also be inspiring. The force of Truth is unmistakable. There is a large-scale momentum of positive change that is evident everywhere, especially when we take our attention from what isn’t working and look for the positive. We must hold fast. We must connect with inner truth and act from a place of calm empowerment. Transcend fear, blame and judgment. Love holds absolute authority and stands in commitment to the good of all. The authority of Love is what we must align to within. It includes right use of power. This is the place from which we must stand to speak the truth that will change worlds. Follow-through and strategic efficiency are two characteristics of the year. These will enable us to mobilize our efforts toward positive change. Our actions can support each other, as well as leaders of integrity and all those who stand for us on the front lines. This IS the dawning of a new age, and the Rooster Year will give us courage and clear vision as together we move through the changes and build a new foundation on which to move forward. I hope you’ll join me for the upcoming “Year of the Rooster” presentations. These lively evenings include an overview of the coming year with strategic tools that help you tap into the vitality and vision of 2017. Rooster Year talks are offered twice, on February 15 and 23. Information and Reservations HERE.